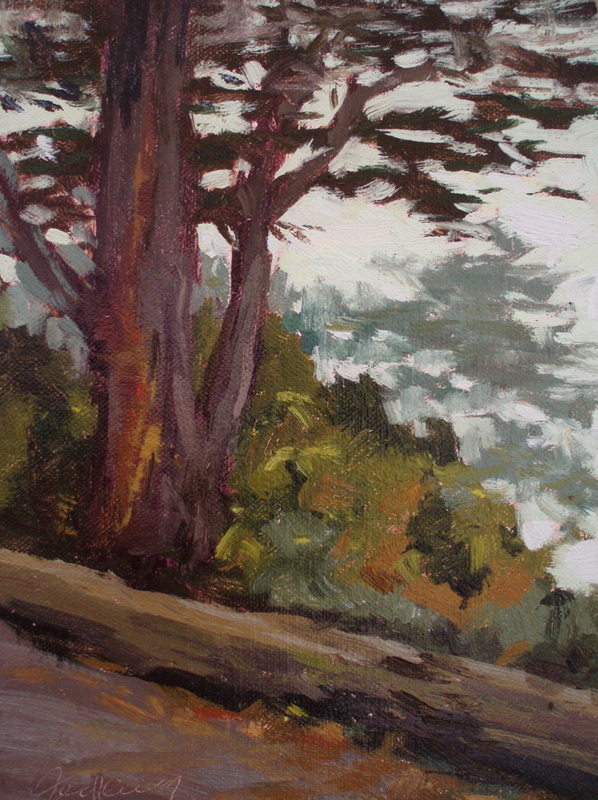 We are painting this Sat (tomorrow) at Golden Gate Park at Stowe Lake/Strawberry Hill, starting at 9:30AM. I will paint either the rock stone bridge or the Chinese pavillion. The next one is Sat, April 26th at Pescadero State Beach (~30 miles south of Half Moon Bay). If you attend and would like a demo or paint with me, track me down. If you’re reading this blog, chances are you’re familiar with social networks, like Facebook, MySpace, etc. I’ve been following Facebook for a while (as part of my role at Wells), and think it has a lot of potential to connect people/groups in much more meaningful ways than MySpace. 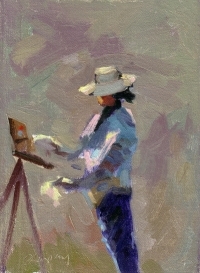 So, I’ve set up a group called “Plein Air Painters“, and I’d love you to join us! 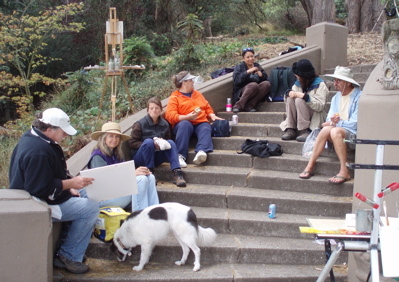 The group is focused on the art of painting “plein air”, outdoors in natural light. For now, membership is restricted to plein air artists, of any level. This is a place to learn, make connections and share your experience. We’ll be able to start online discussions, submit photos of paintings to share or critique, and list events–like shows, paint-outs, workshops, and so on. You’ll then need to check your email for a confirmation from Facebook, click the link in the email to confirm with Facebook. Click the “Request to Join Group” link on the right, below the painting. We had a good turn out at today’s Verde Artist Guild paint-out, dispite the thick fog. We all managed to find something to paint, and in fact many of us painted a house across the street from the park, at the corner of Buena Vista East and Dolores. A long-time resident walking her dog told us the house belong to a former US ambassador, and that he’d purchased several homes on the same street for his children. Nice guy! Joining today was (left to right), Richard, Christin Coy, Karen, Julia Seelos, New Person (sorry, can’t recall her name! 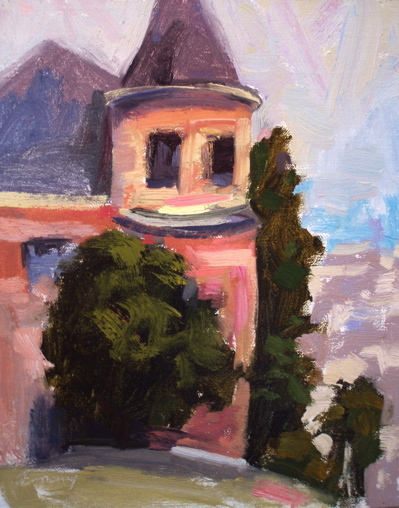 ), Cathy Boyer and David Stonesifer. I managed to paint to small studies below. North Tahoe Arts in partnership with East West Partners through the Tahoe Mountain Resorts Foundation, Truckee Gallery, and the Truckee Donner Land Trust plans a month-long celebration of the wonders of Martis Valley at Lake Tahoe in October, 2007. As part of this celebration we are planning a three-day “paint out” at various locations throughout the Martis Valley the weekend of October 5, 2007, culminating in a sale and cash awards ceremony at The Village at Northstar at Tahoe on Sunday, October 7, 2007. East West Partners, the developers of the new Ritz-Carlton Highlands Lake Tahoe and The Village at Northstar hope to make this an annual event drawing regional and nationally known artists and collectors. As you may know, early October is a glorious time in the mountains when nature is at its best. The painting opportunities should be wonderful. After the Ritz-Carlton, now under construction, is completed, it is anticipated that it will be the venue for this annual event. Low-cost housing at Northstar or home stays with local Tahoe artists will be available on a first-come first-served basis. There will be no entry fees for participating in this event. Please let us know, by responding to this email, if you have an interest in participating or have any questions, please send us an email at the contact number below”. 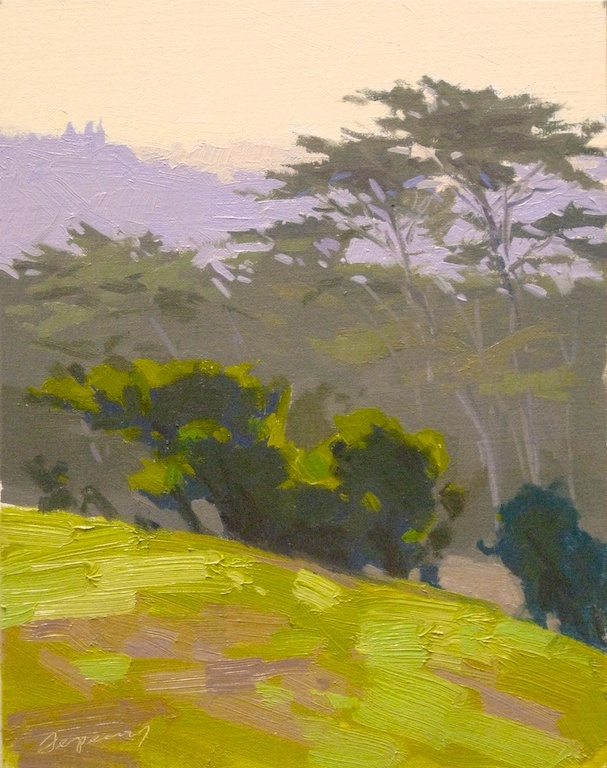 Friends of Verde Artist Guild,The Verde Artist Guild will be hosting a paint out July 14 at San Francisco’s Buena Vista Park. This is the city’s oldest park, with 360-degree views of the city, Golden Gate Bridge and the Bay. Bring a bag lunch and share your work, including any critiques you’d like. There is generally plenty of parking available, but carpool if you can (see below). Where Buena Vista Park, San Francisco. We’ll meet in area of the tennis courts, just above them. See the “Getting There” section below for specific details. You can also paint at the very top of the park, where a grassy knoll offers 360-degree views. If you can’t find the group, call Ed and let him know (cell phone SIX-FIVE-ZERO-868-2551). There are many flat, paved trails that lead to the top of the park, although Ed will be painting just above the tennis courts. Getting There Buena Vista Park is located between lower and upper Haight a few blocks south of the tip of the Pan Handle. Haight Street forms its northern boundary, and it’s ringed by Buena Vista Avenues East and West.From the 101: Take 101 North to San Francisco, exit Duboce Avenue (bare left, you’ll head straight off the freeway onto Duboce Ave.. Turn left on Market Street, stay in the far right lane. After the Safeway on your right, turn right onto 14th Street. As you head up 14th, look straight ahead of you: the large pink buildings with the park behind is where you’re headed. Head straight up the hill, turn right on Buena Vista Terrace. It will end at Buena Vista Park. Turn left onto Beuna Vista Avenue East and park in front of Park Hill condos (large pink building on your left). After you park, cross the street to the park, and head right, down the sidewalk that circles the park. At the corner, you’ll see a wide concrete staircase, head up and take the road right over the tennis courts. There are great views of the city there, through Monterey Cypress trees, or, you can paint a wide range of Cypress, Pine and Eucalyptus in the area. Parking There is usually plenting of parking in front of the old St. Joseph’s Hospital, now Park Hill condos. That is located at 351 Buena Vista Avenue East. You can’t miss it, it’s a huge pink building. When Saturday, July 14, starting at 9:30AM. Some people paint until sunset, some stop after lunch–your choice. We’ll meet for lunch around 12:30PM, in the area above the tennis courts. Ed lives across the street from the park, so bathroom breaks will be available at lunch time. We held our (roughly) monthly Verde Artist Guild paint-out today with about 7 artists attending. I started in complete fog on the Peninsula side of the bay, and funny enough the ocean side (over Skyline Blvd) was beautiful! 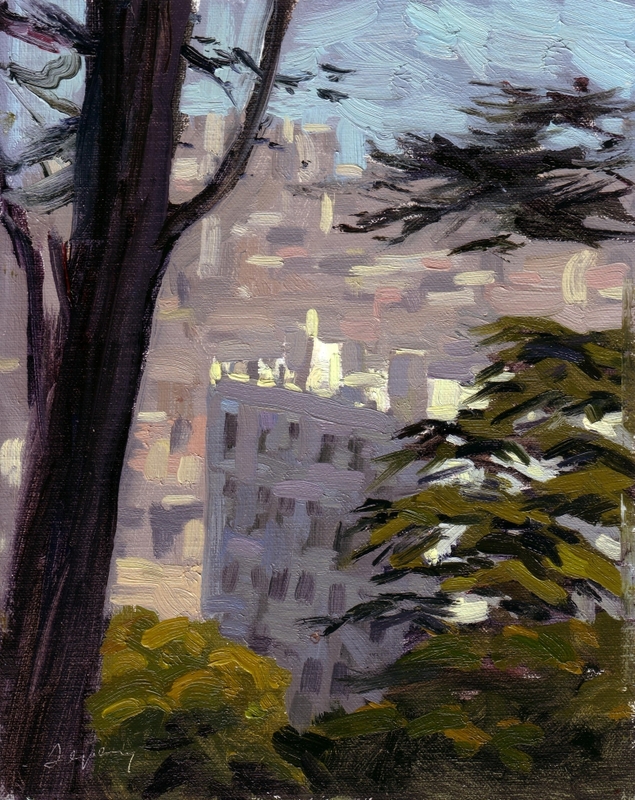 I ended up doing two small studies, one of which was a “scraper”, the other is pictured below. This is just an okay photograph. Once it’s dry, I’ll do a digital scan. I’m off tomorrow to Lake Tahoe for Thanksgiving week. I’m hoping for snow, but the forecast is for sun. I called Andy Skaff and he’s out of town, so if anyone else up in Tahoe will be around Thanksgiving week, send me an email or comment here. Verde Artist Guild members painting away…. Had a great time painting with Verde Artist Guild on Sunday. Great group of artist’s showed up. And wow, what a great day. I started early–about 7:30AM–and the light was so perfect. Hollywood film director’s call it “golden light“, when the light is lowest on the horizon, in the early morning or late evening. The color of the light is so striking. 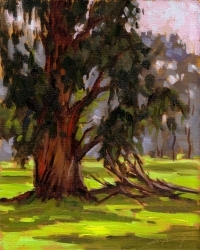 So, as I said, started my painting of a Eucalyptus early. As artists starting arriving, as the host, I thought it important to be social and say hello to everyone. Glad I did, but by the time I returned to my painting, it was really striking how the color of the light had changed–from a warm orange to a flat, grey-ish blue. Undeterred, I finished the painting’s color harmony from memory, and from what I’d done so far. I’m particularly happy with this small passage. As you can probably see, my work is loosening up. I’m trying to see as the great American Impressionist Charles Hawthorne advised, whereby you don’t see “things” you see shapes of color. To get this effect, I’m painting without my glasses most of the time. I see my canvas just fine, but the subject in the distance is blurred. I’m near-sighted, and would never consider lasix eye surgery now. It’s too great an asset to take my glasses off and see in the abstract. Don’t you just love the way abstract bits form the final image, below? I haven’t decided whether this painting is done yet. It’s sitting in my office at Wells Fargo (where I’m working on a contract basis for a few months to save up 😉 I think I may add some fallen branches to the grassy area at the bottom, as I feel the tree comes out of the ground a little to strongly, seems isolated to me. I will be joining the Verde Artist Guild for this paint-out next weekend. If you’re a collector, this is a good opportunity to watch artists at work, and to discover new talent. Please join the Verde Artists for a paint out on March 19 in Palo Alto on Stanford’s campus at Arboretum and Lasuen roads. That is near Arboretum and Quarry Roads. There are eucalyptus and oak trees in a park like setting. We’ll meet at 9am, with a lunch break. At the break, you’re welcome to either bring paintings to share/critique, or share your painting from the morning. Many of us continue to paint through the afternoon as well, but no guarantees. From 280 take the Sand Hill exit east. Turn right at Arboretum (Stanford Shopping Plaza) and right on Lasuen Road. From 101 take the Embarcadero exit west, turn right on Arboretum and left on Lasuen Road. 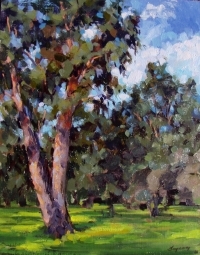 The paintout I organized between Verde Artist Guild and OPA (Oil Painters of America) was featured in PleinAir magazine (now called Fine Art Connoisseur)! Here’s the writeup and picture.